Adrift on whim I spiral here and there during the short summer in Vermont. On the luckiest of days I answer to no one, dismiss errands, and banish have-to’s completely. Apparently, according to several research studies, “The mere thought of pleasant alternatives made people concentrate less” (Konnikova). Beyond my morning ritual of brewing a cup of strong black tea, I set my day’s course as casual as possible. Hot afternoons are spent near a local lake, cooler evenings cruising along on the bike path. In my back field, among the hillside of green ferns, purple flowers grab my attention; I waste away an afternoon photographing countless budding lupines. My fascination over this wildflower originated from a children’s book, Miss Rumphius, which I read to my daughter over and over. Lupines produce offspring freely, and these grow to flower and make more lupines than you can count. Fields are quickly over-run with these colorful spikes and while the environmentalist might look at them as an invasion, I see the rainbow of lupines as pure joy! During the summer months I keep my look casual too with long dresses, big hats, and even bigger sunglasses. 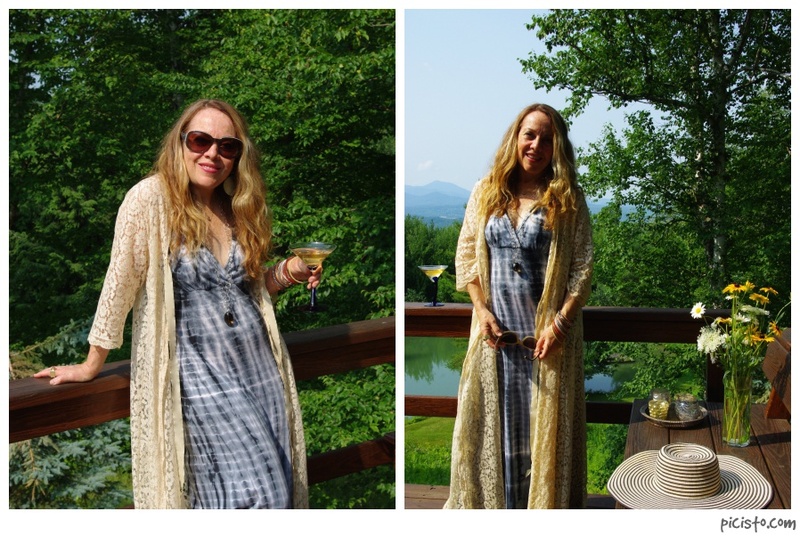 This Prana maxi has been a summer favorite for a few years now, but topped with a full length lacy new-to-me vintage peignoir, I feel easy-breezy on my deck. Add a smoky quartz crystal on a long silver chain and your most fun shades, shake up a cocktail, and you’re all ready to enjoy the summer sunset. 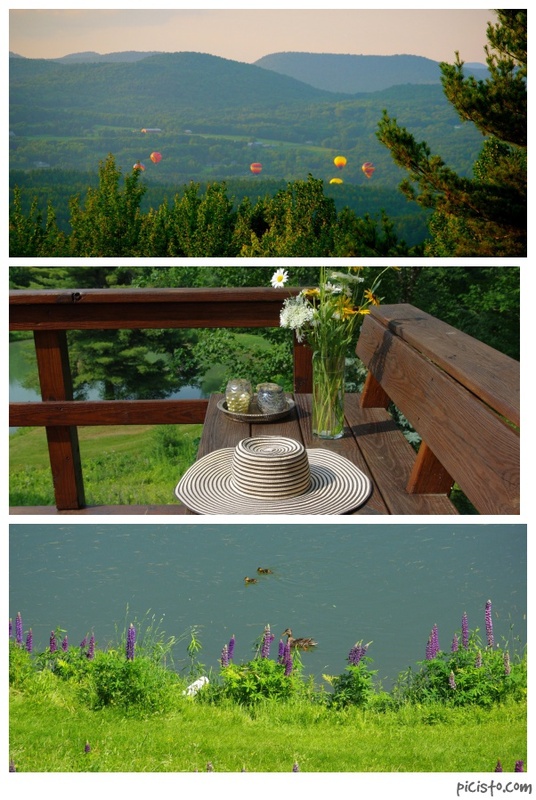 This particular weekend we were delighted by the balloon fest — watching as one, then two, then six, bursts of color came floating up over the ridge for a fleeting second. Each year we are entertained by these massive floating orbs, and each year I swear I will arrange to ride in one, but for now, just enjoying their gentle presense on the horizon is fabulous. (Last year I wrote about this: Saturday Play Date). Our pond is yet another source of carefree summer entertainment. Some days watching the ducklings is enough for me, as they splash about following their mother’s lead this way and that, I am reminded to let myself wander. Enjoy the bright sunshine and soothing breeze. Enjoy the absence of schedule and demands. Just be. I am a fan of Free People and adore their cotton maxi. 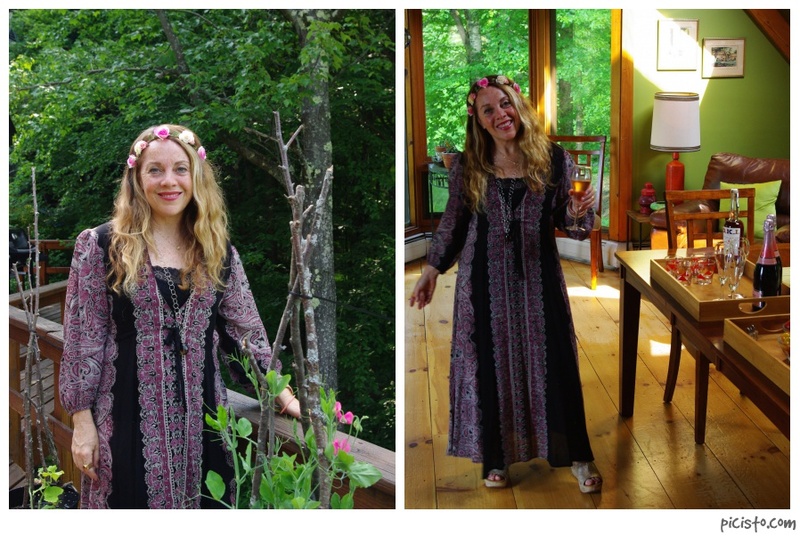 Vacation demands totally relaxed garb from garden gatherings to evening soirees and along with my dress, my gold Kork-Ease also fit this criteria perfectly, as they are stylish and completely walkable. Add a crown of flowers, cloth or real, and you will feel like Titania herself. I keep a few bottles of Gruet Rose on hand for impromptu celebrations and keep the rest of the preparation simple. Tis the season. Bring flowers inside. Invite friends over. Open all your windows and let the breeze race about your home. Watch the day fade into night. Observe all the stars, one by one, as they sparkle up the black. Summer is worth smiling over. OK– I must say that your sense of style, grace and whimsical elegance is a joy to behold. I don’t usually gush, but you made me do it! 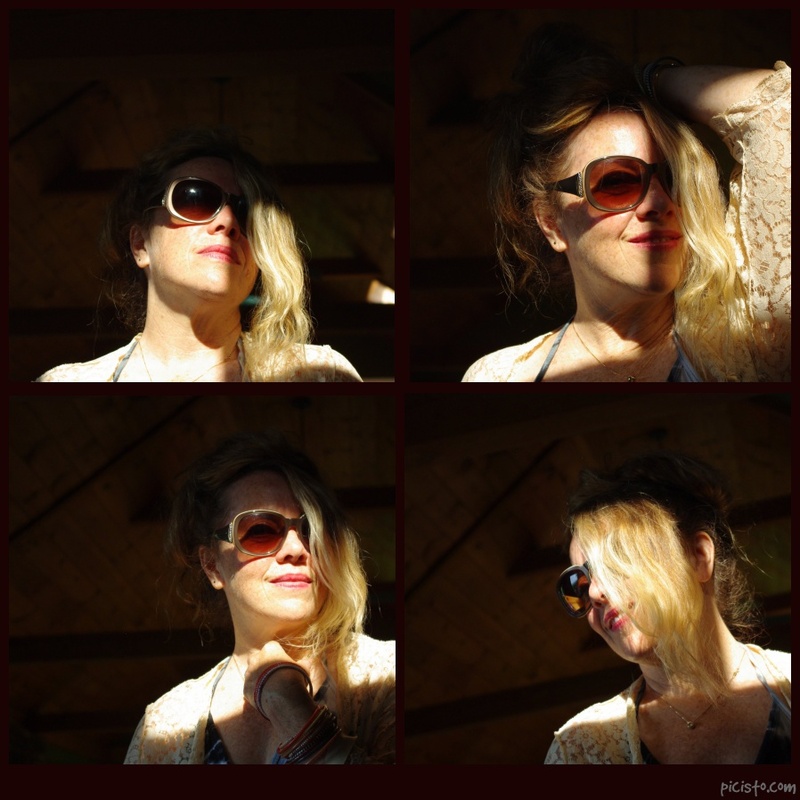 Summer just makes you happier! Thanks for reading Bill! Aww! Looks like a blast!!!! That peignoir is stunning. It looks great on you! thank you!! vintage is too much fun!! That’s it! 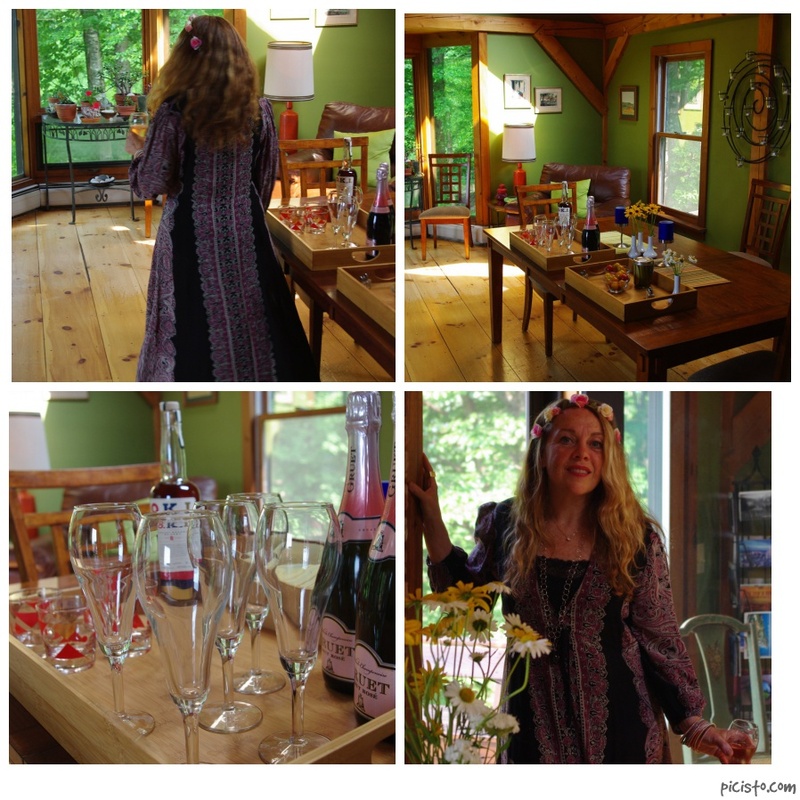 I’m coming to Vermont! 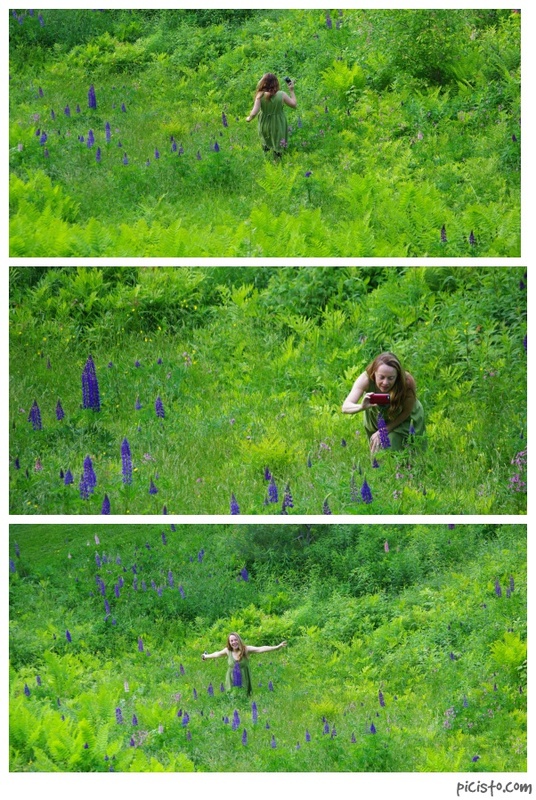 The Lupines got me…aww, they’re so beautiful! Thanks for sharing yr summer with me. Those pics are so relaxing and awesome. P.S. By the way, thanks for visiting my blog. Love the flowers around the head and the printed cotton maxi – boho chic! !